So this post has been…a little delayed, but I still wanted to talk about my Oscar party, because a friend of mine took such nice photos for me and it seems such a shame not to share them. See? Thanks, dude. You’re my official party photographer from now on. This is about the fourth or fifth year that I’ve hosted an Oscar party, and it is hands down my favorite to plan. I’m always trying to make or do something different than the year before, and this year was no exception. 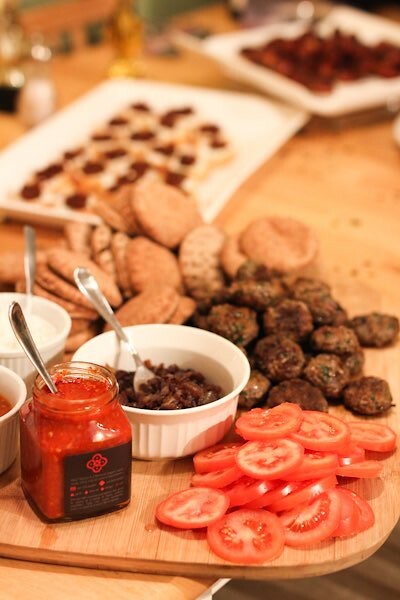 I tend to go with finger foods for my Oscar parties — just a tad more upscale than your run of the mill chicken fingers and pigs in a blanket. Not like caviar or foie gras on toast points, but something different and fun. 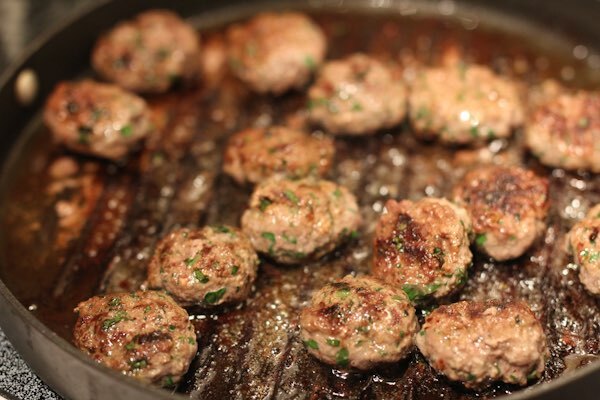 Another factor this year was the necessity for a few make-ahead dishes. Thanks to an overnight shift at Job 2 the night before, I made a conscious effort to cut down on the amount of work I would need to do on the actual day. It’s smart to do this any time you’re entertaining, but it was a necessity for me this time around. 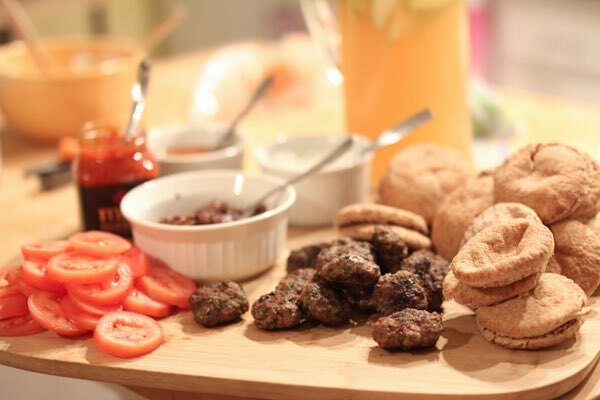 For my “main” offering, I (with the help of my friend Sara via text), came up with Mediterranean style sliders with all the fixings. These were fun and super tasty and I will be making a regular burger sized version of them this coming summer, you mark my words. 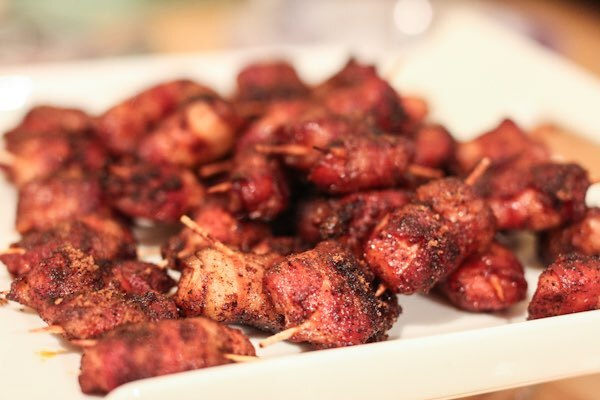 My next offering was a tasty nibble I found via Pinterest, these sweet and spicy chicken/bacon bites. 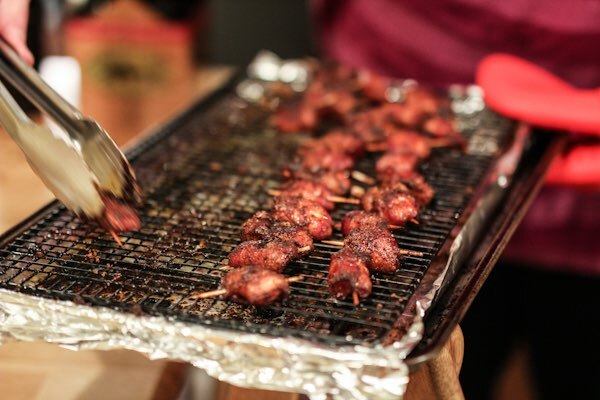 Diced chicken, wrapped in bacon, rolled in a brown sugar/spice mixture and baked. Easy to assemble, a great make-ahead option (I would not roll them in the spices until you’re ready to bake though), and just damn delicious. A hit all around. I might need these again soon. For the protein, you know. 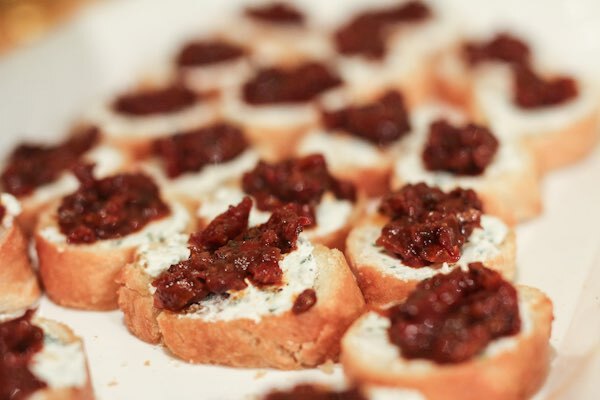 Because I can’t host a party without something on top of a slice of baguette, I threw together these crostini with sun-dried tomato jam and herbed goat cheese, an old favorite of mine. The tomato jam is better when you make it a few days ahead of time, and all you have to do to serve is toast the bread slices, stir a little fresh thyme into softened goat cheese and have at it. I assembled mine a little differently than Giada did hers, but I won’t tell if you won’t. Not pictured: Requisite crudite tray, because vegetables are boring. One thing I’ve started to do when entertaining is to offer a signature cocktail. Instead of assembling a full bar (which, let’s be real, my tiny kitchen is not equipped for), I serve just one main drink alongside a couple basic spirits, beer, or wine. 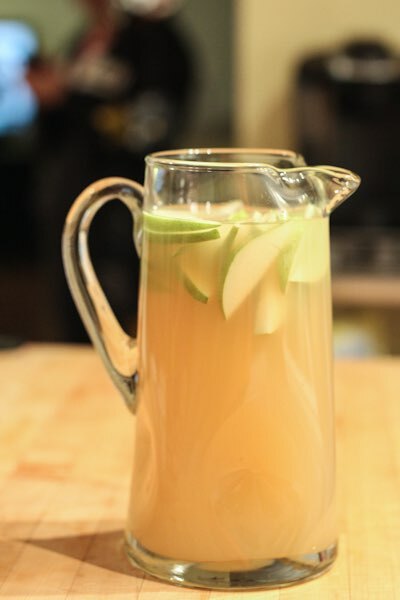 This time around I crafted a pear sangria, made from pear juice, white wine, and a touch of St. Germaine. Fresh sliced pear to garnish. Boozy! Careful with that one, it’s dangerous. Along with our savory finger foods, I also served up some small(ish) desserts to finish up the evening. The first, which there’s no photos of because they were the last thing I served and we were all stuffing our faces full of sliders and bacon wrapped chicken deliciousness at that point, were my peanut butter tandy cakes. Always a hit. 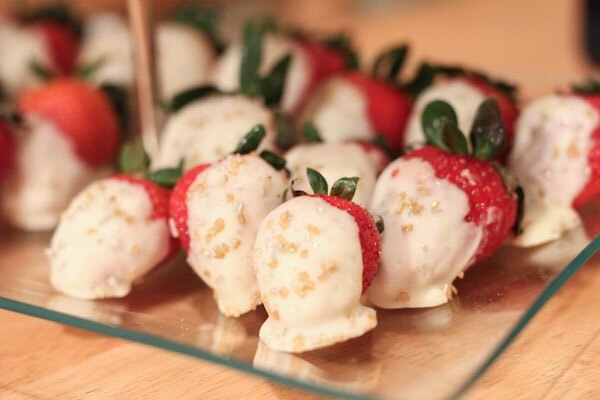 Next were some white chocolate dipped strawberries. 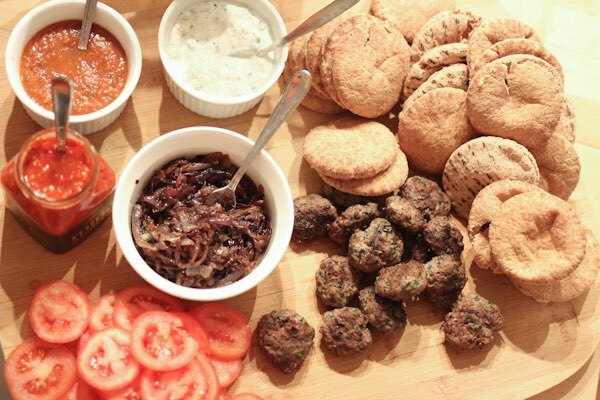 Simple, pretty, and…healthy? Mer. Maybe a little. My final dessert was the result of seeing something on Pinterest and adapting it to suit my own cravings. I saw these mini cheesecake cookie cups and thought they would be perfect, but at the time I was planning this shindig I was craving lime. Specifically, key lime…anything. So I nixed the cherry pie filling from the original recipe, whipped up some key lime curd instead, and voila. 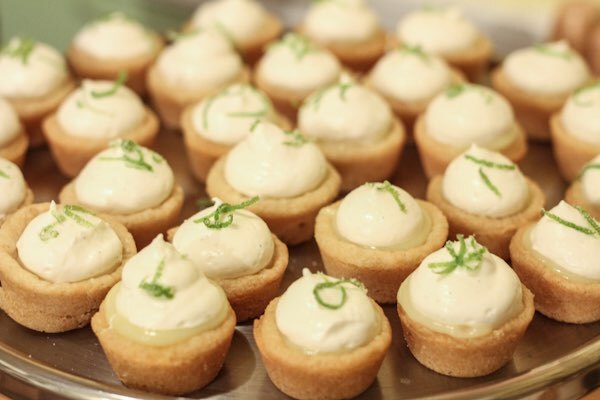 Key lime cheesecake cookie cups. Big name. Tiny dessert. Freaking YUM. Seriously, these might warrant a post of their own in the future. Until then, I am working on ideas for my next party. Which is next week, so I might post about it by September.